Frame Aluminium frame with fuel in frame. Front Suspension Ø47 mm Showa inverted forks, adjustable compression damping. rebound damping and spring preload. Rear Suspension Showa® coil over monoshock, adjustable compression damping. rebound damping and spring preload. 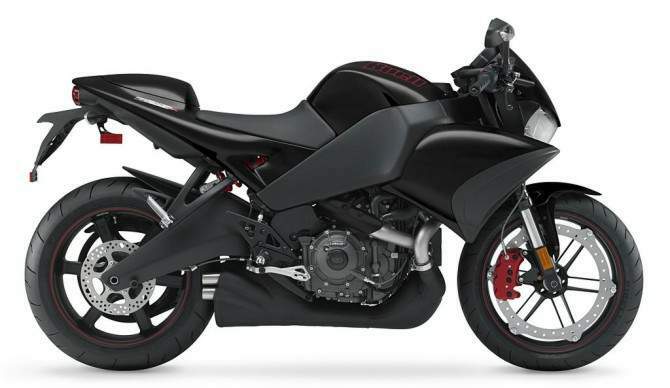 Rear Suspension 120 mm / 4.7"
Wheelbase 1384 mm / 54.5"
Buell Motorcycles got the jump on its foreign rivals unveiling its 2009 superbikes, with the American company unveiling the new Buell 1125CR. "Part superbike and part streetfighter, the 1125CR is my vision of a 21st century Café racer. It's got Clubman-style bars and a flyscreen instead of a fairing. Then we geared it down to optimize acceleration. With a class-leading weight-to-horsepower ratio, the 1125CR takes streetfighter performance to a new level." 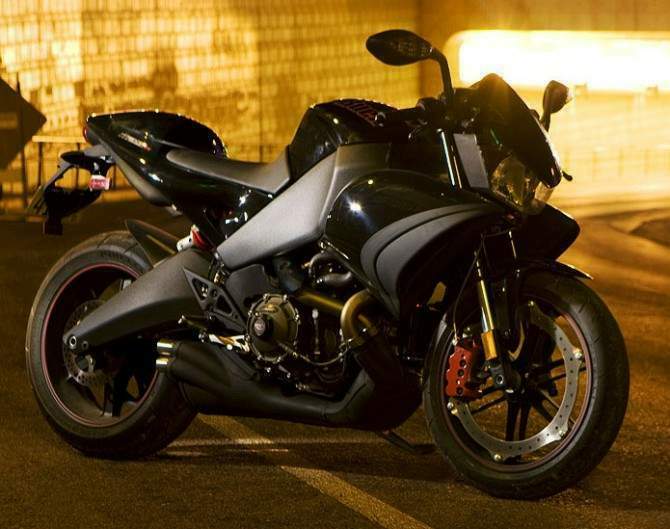 The new machine incorporates the same liquid-cooled 1125cc Buell Helicon V-Twin powering its superbike kin - the 1125R. Internally, however, the engine (in both machines) has been tweaked for '09 with "targeted fuel injectors, relocated O2 sensors and updated engine spark and fuel maps." As a Buell, the 1125CR features all the usual Buell-esque engineering i.e. the underslung muffler, fuel-in-frame chassis (5.3 gallons in the Buell Intuitive Response Chassis), and the ZTL2 (Zero Torsional Load) front brakes. 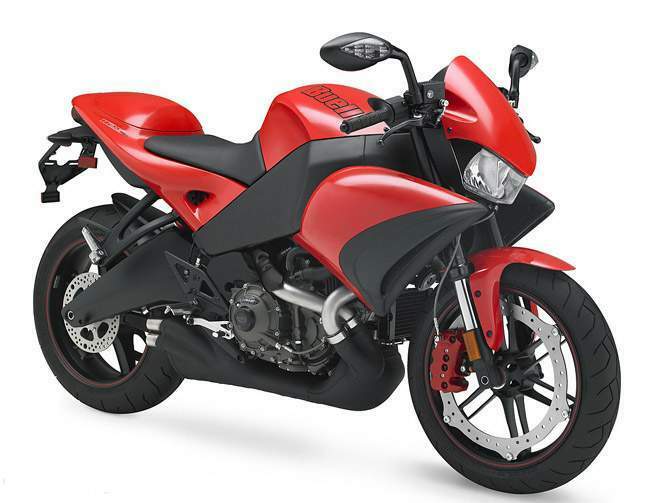 The new Buell also features fully-adjustable Showa components, a 47mm fork and rear shock absorber. From a visual standpoint, the CR is easier on the eyes than its R sibling. With a pared down front end from the windscreen and narrower headlamp pod, the CR looks sleeker. Available in the same black scheme as the R, the CR looks quite fetching in red. The 1125CR’s chunky, muscular styling oozes testosterone, but this certainly isn’t a beautiful looking bike. The riding position reminds you of older Ducati Monsters, the spacious saddle lets you move around a bit till you find a position that’s comfortable for you, and the clutch and brake levers are adjustable. On the move, the Buell 1125CR feels unexpectedly docile. At least in the beginning. But open up that throttle and you feel a direct connection between the accelerator and the rear wheel. And the six-speed gearbox is quiet, precise and quick. The 1125CR can be hustled around corners pretty quickly. The bike’s aluminum perimeter frame, which also doubles as a fuel tank, mated to a 47mm USD fork at the front and monoshock at the back, works well. The Pirelli Diablo Corsa III tyres are excellent, and the 375mm single brake disc at the front, with its eight-piston calipers, is quite capable of hauling up the Buell in a hurry. With its rather extreme steering geometry, the 1125CR is very agile and changes direction in a snap. But the surprising bit is that it also manages to remain stable at elevated speeds and remains planted in high-speed corners. The suspension, however, may benefit from some recalibration – the bike tends to hop around a bit when the roads get rough. The technology that’s gone into these two bikes is as unconventional as their styling. 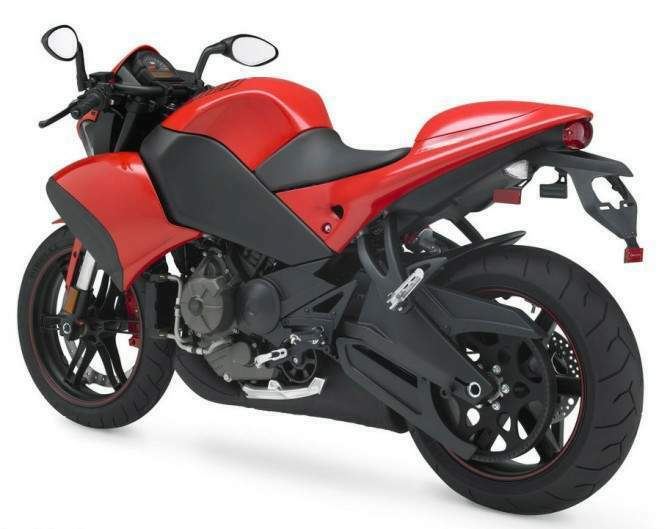 The 176bhp K1300R uses shaft drive, the 146bhp 1125CR uses belt drive. The BMW uses Duolever front suspension, which you won’t find on any other bike, while the Buell’s perimeter disc braking system at the front wheel entails the use of a single disc – unlike all other large-displacement sportsbikes, all of which use twin disc set-ups at the front. The BMW is the better bike for riding in the city, thanks to its anti-lock brakes (ABS) and optional traction control – things which provide a lot of reassurance during hard braking and acceleration. The riding position is pretty comfortable too, though your shin will often hit the BMW’s engine casing on the right hand side, when you put your feet down while coming to a complete stop. Riding the Buell in the city gets tiring within a few kilometres – the high footpegs, and the shape and the positioning of the handlebar sees to that. But while it affects low speed comfort, the 1125CR’s sports-oriented riding position is perfect for high speed cornering. Another thing that goes against the Buell is its brakes, which work in a rather abrupt fashion. Initially, the brakes don’t seem powerful enough at all and then, when they suddenly bite, they can upset the bike somewhat. Developed by Rotax, the Buell’s v-twin is one of the most pleasant twin-cylinder engines current available in the market. Low-rpm torque delivery makes the bike very rideable at low speeds and the linear power delivery means the bike picks up speed smoothly and consistently. The BMW’s four-cylinder engine is also much improved over its predecessor – it feels significantly more powerful, the roughness has disappeared and power delivery has been smoothened out very well. On the highway, the K1300R offers better wind protection than the 1125CR and feels more planted, more stable, while the Buell feels more nimble and responsive. When it comes to high speed cornering, the Buell outshines the BMW. The K1300R isn’t bad – in fact it’s quite good considering it’s size and weight – but the Buell is in a different league. The Buell’s braking characteristics and suspension set-up are just more conducive to letting the rider push harder in the corners, and the bike is more supple and responsive in the bends than the BMW.